A guinea pig is not a large hamster or a "beginner pet" for a young child. They're wonderful creatures that make fun, unique pets, but bringing one into your home is a commitment you need to be ready to make. I guess we're kind of nerds, but we actually researched guinea pigs for several weeks before deciding to bring our little girl, Tiki, to her "furever home." I've owned hamsters, mice, and rats, so I feel confident saying that guinea pigs are a category all of their own. Neither from Guinea nor pigs, their Latin name is Cavia porcellus. They're so dramatically different from other rodents that some scientists believe they shouldn't be classified as rodents (like how rabbits are not rodents). 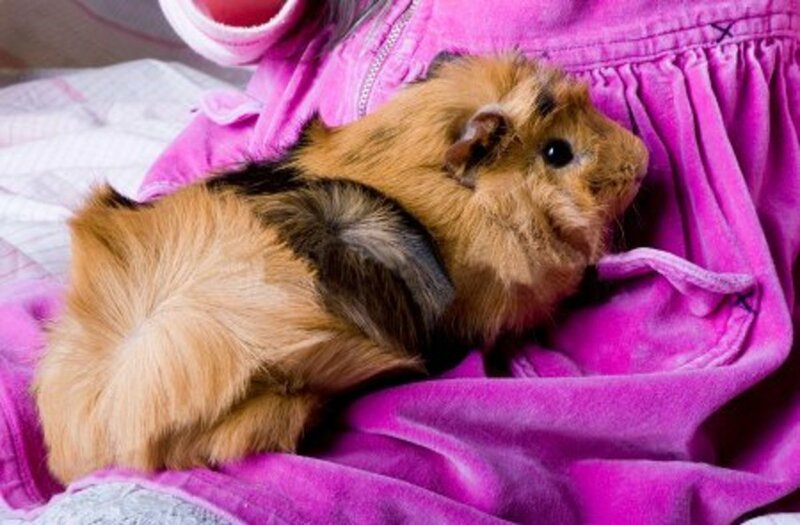 Whether you're still trying to decide whether a guinea pig is the right pet for you or have your heart set on one of the little critters, this list of 10 things you need before adopting a guinea pig will help ensure your pet has a happy, healthy welcome into your home. You'll need to prepare a cage for you guinea pig before you can bring her home. 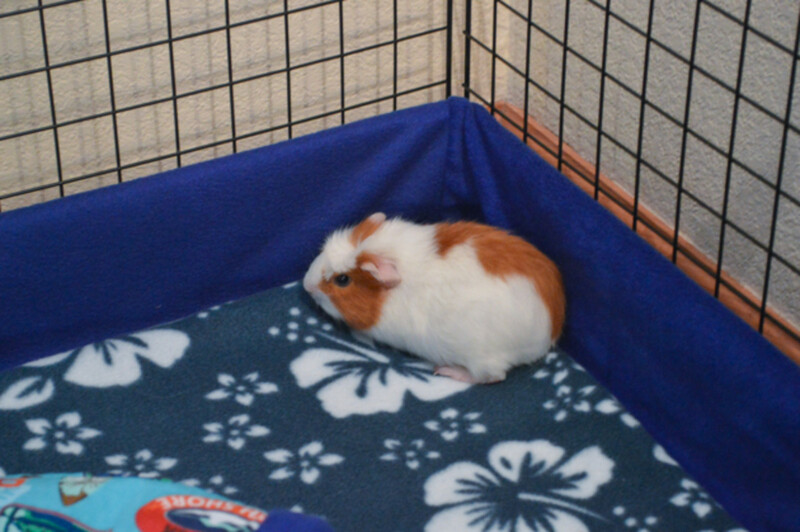 Unlike most other small pets, guinea pigs do not need a fully-enclosed cage. You also don't need to worry about elaborate tubes, turrets, wheels, or exercise balls - these things can actually harm guinea pig and they don't really fit in most of them, anyway. Guinea pigs need lots of space. The Humane Society recommends that a single guinea pig have at least 7.5 square feet of space. That's a big cage! Unfortunately, most pet store cages are expensive, too small, or just downright unsuitable for pigs. Cavies should not be kept in terrariums because they don't have enough ventilation, nor should they be kept in cages with wire bottoms. Luckily, you can make a safe, suitable guinea pig cage from wire shelving and corrugated plastic. This type of cage is usually called a C&C cage, which stands for "cubes and Coroplast." I was able to make a C&C cage that's approximately 8 square feet for about $35. Not only did the cage cost far less than pet store options, but it's also much healthier. Watch out - most of the wire cube shelves Target currently sells have too-big holes that a guinea pig can get stuck in (or even escape through!). I purchased my wire shelves from Amazon and picked up my plastic at Home Depot. Guinea Pig Cages has a fantastic, in-depth tutorial with photographs that shows you how to make your own cage. If you're not the DIY type, you can actually buy C&C cages from them, too. Just like with the cage, your hamster expectations have to go out the window when you bring home a cavy. The phenols in cedar and un-kilned pine can cause piggy respiratory infections and must be avoided. 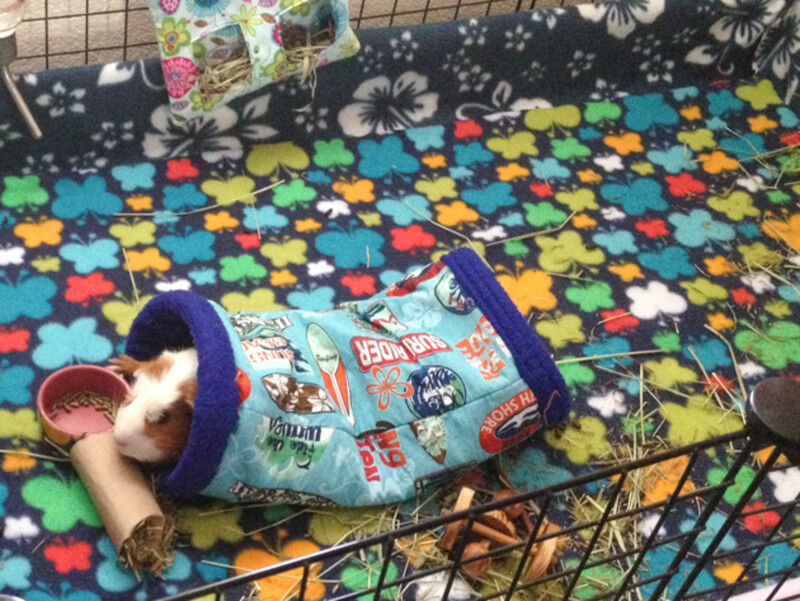 There are several piggy-safe loose bedding options, but I chose to use fleece bedding for my cage and I love it. 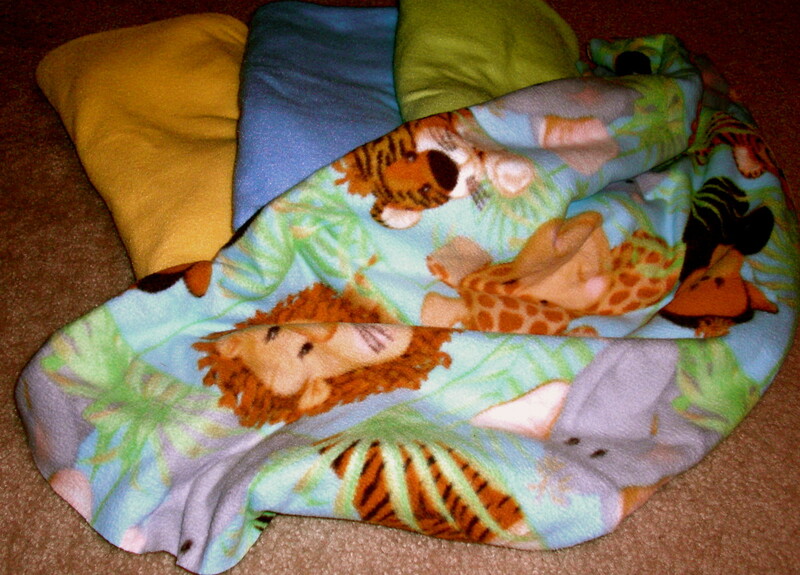 Fleece bedding is guinea pig safe, reusable, cute, and makes it easier to tell if your pet is eliminating properly. 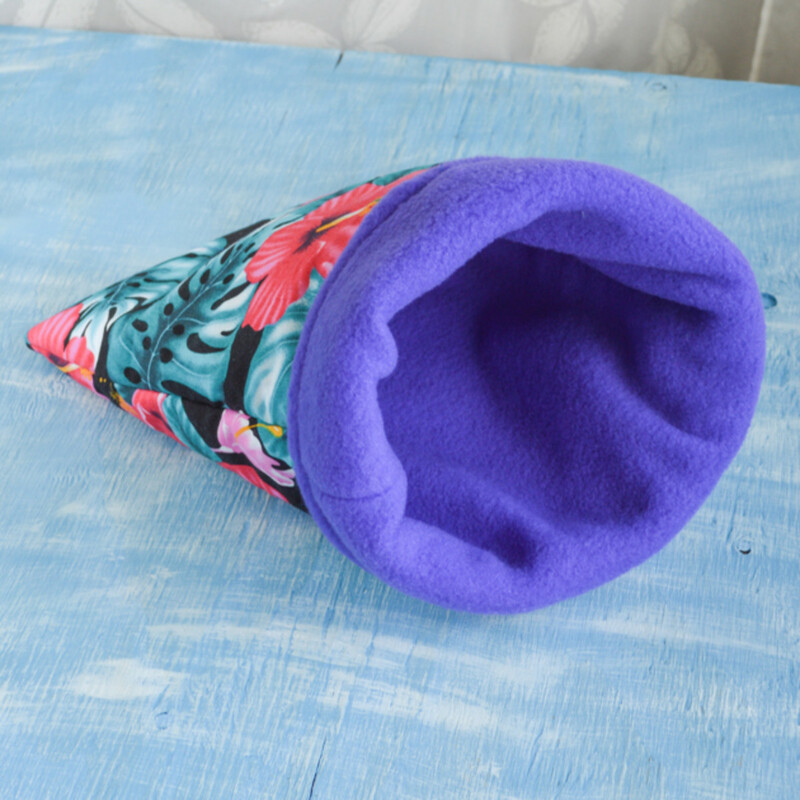 You can purchase ready-made fleece bedding systems, or make your own. Jennifer Martin has a great (free!) PDF tutorial on how to make your own absorbent guinea pig mattress, or you can buy one from a website like Piggy Bedspreads. Guinea pigs are naturally shy creatures and need several places to hide. In general, you need a number of hideies equal to your number of cavies + 1. If you have one piggy, two spots to hide works. If you have two pigs, you'll need at least three hideies. 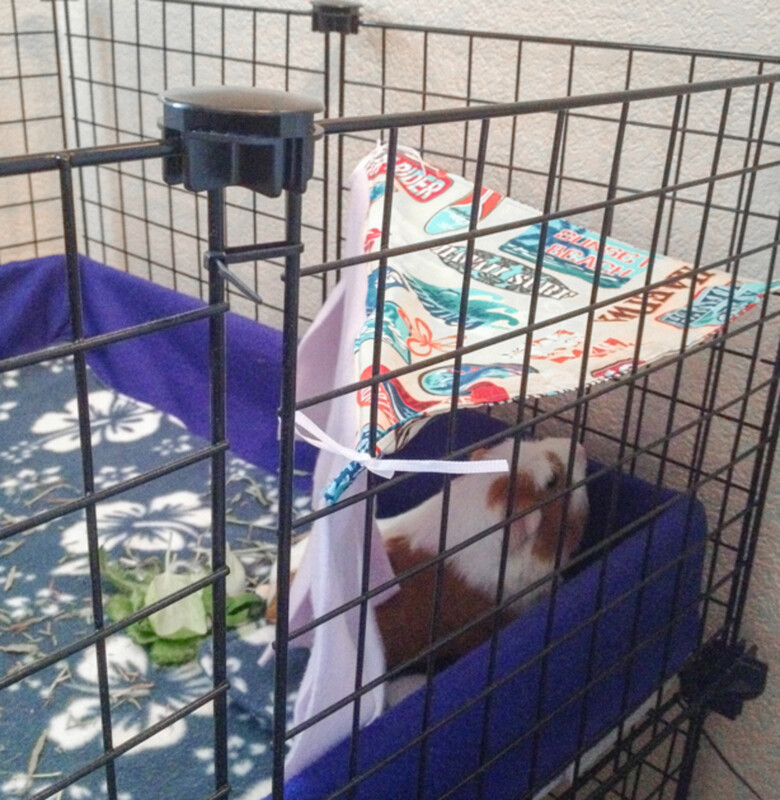 There are a variety of store-bought and homemade options available for guinea pig hideies starting from as simple as an empty oatmeal carton to a multi-story work of architecture. Just go with whatever speaks to you and your budget! Hay should be a guinea pig's primary food, and it should be offered freely at all times. 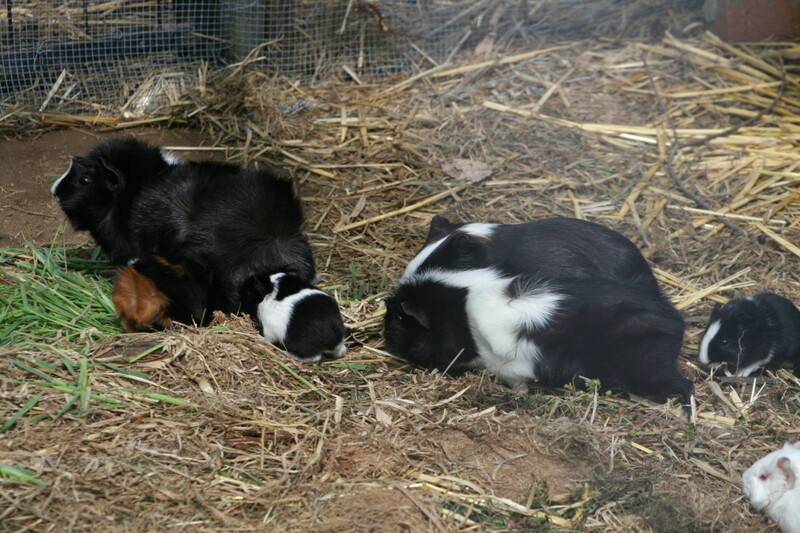 Grown guinea pigs need Timothy hay, but little ones and pregnant sows can have higher-calorie alfalfa hay. Your best bet is to look for Timothy hay online or at a pet store - don't head to the local tack shop to pick up some horse hay! Sure, horses can also eat Timothy, but you don't want to deal with a horse-sized bale of hay in your guest bedroom. You can dispense your hay pretty much anyway you'd like. My girl loves pulling her hay out of a toilet paper tube (added benefits: free and fun for her to chew on later! ), but she also has a hanging cloth hay sacks. 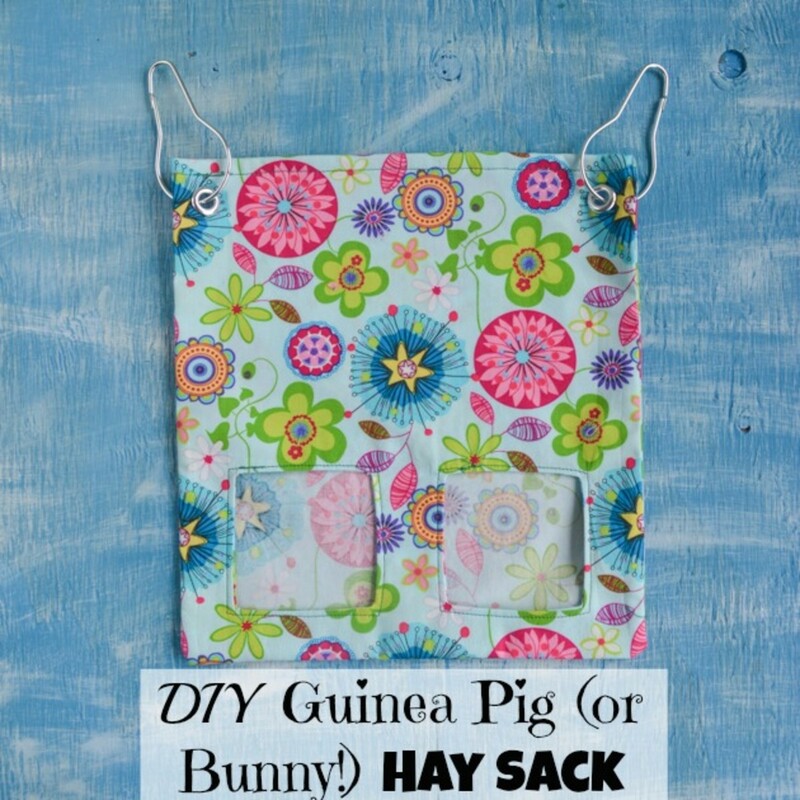 I make and sell them in my Etsy store, but I also have a free tutorial on how to make your own guinea pig hay sack. Like most pet rodents, guinea pigs need a water bottle, not a water bowl. A hanging water bottle with a ball bearing vacuum valve is perfect for a guinea pig. If it's going to hang inside the cage (as opposed to the bottle mounting outside the cage), you might want to consider a chew-proof bottle. 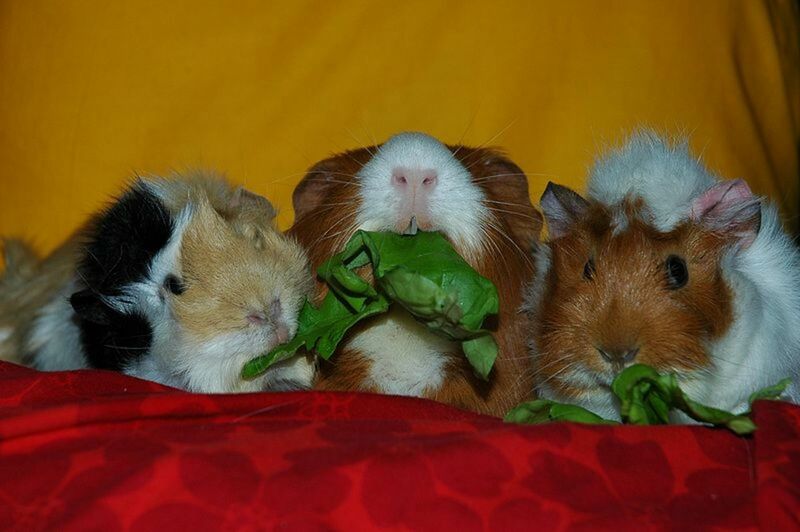 Guinea pigs can and will chew on the things in their cage! I use a glass water bottle to both eliminate the risk of chemicals leeching from the plastic and keep teeth marks out of the water resevoir. In addition to hay, guinea pigs also need Timothy hay pellets. If you go to the pet store, you'll see all sorts of pellets with added this and that or with seeds or flowers. They may seem like a tasty treat for your little friend, but the healthiest option is just plain hay pellets. Unlike hamsters, guinea pigs should never have seeds. 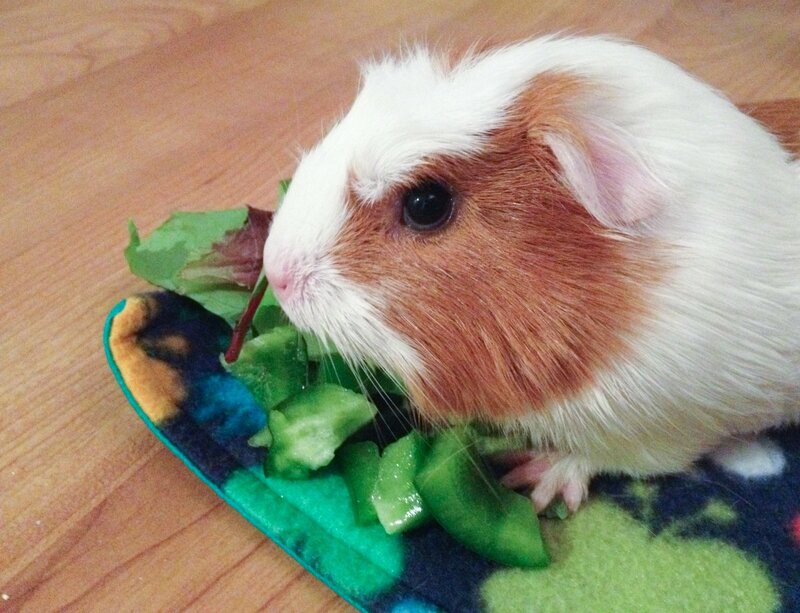 While guinea pigs are capable of eating many flowers, it's better to feed them fresh produce and keep their hay pellets hay pellets. Oh, and, of course, you'll need a little food dish for the pellets. Just like with the water bottle, a chew-proof option works best. Guinea pigs are super adorable, but they're hay processing machines. They eat hay constantly on one end and send all the extra fiber right out the other end. If you've never owned a guinea pig, you'll probably be pretty surprised by the amount of clean up the cage needs each day! You can clean a hamster cage once a week, but I clean our guinea pig's cage at least twice a day. The easiest way to do this is with a mini sweeper and a small dust pan that fit right down in the cage. Your guinea pig's nails will grow and grow, but nothing in her daily life of fleece palace luxury will wear them down. My vet explained that most people don't trim guinea pig nails soon enough or often enough and that you'll probably need to trim his/her nails within a couple weeks of adoption. 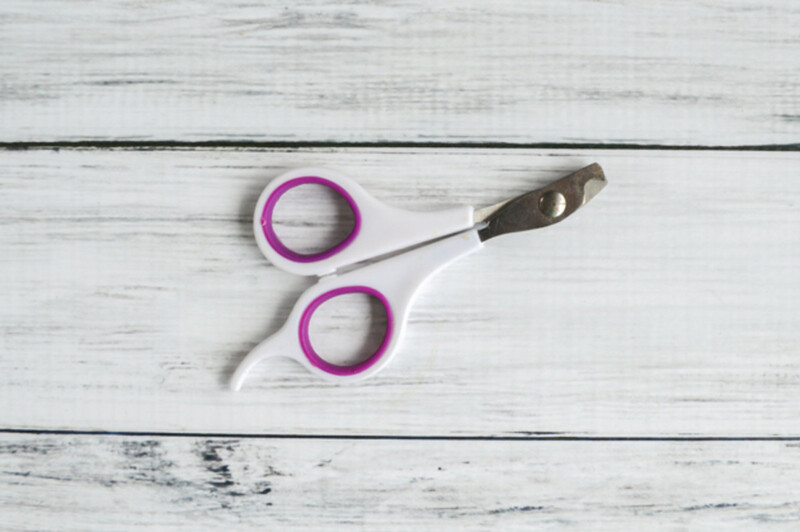 Make sure you purchase nail scissors sized for rodents - don't try to have at it with a leftover pair of dog or cat nail cutters! Like other animals, guinea pigs do have a "quick" in their nails that you should avoid cutting in to. On my vet's recommendation, I use Oxbow Daily C. My girl absolutely loves her morning vitamin and snarfs it down immediately! 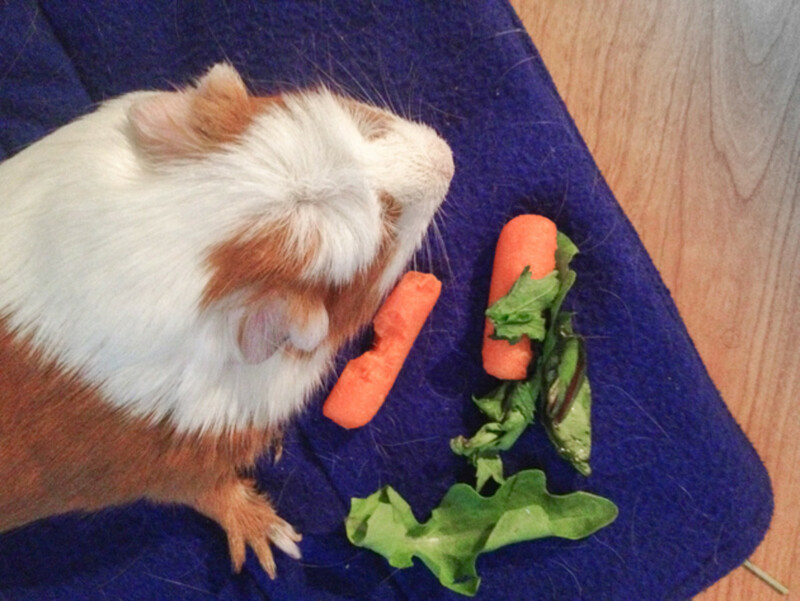 Guinea pigs, like humans, cannot produce their own vitamin C. Ideally, your cavy should get all her needed C from food, but that can be difficult to do. Vitamin C is unstable and breaks down quickly in sunlight, so even C-fortified pellet food won't contain the listed quantity of vitamin C for long. Once again, you'll probably find lots of not so great options at the pet store. My local chain pet store only carries vitamin C you add to the water bottle, but this type of supplement is both ineffective and potentially harmful. There is no way to know exactly how much your pet is getting so you can't tell if she's had enough C that day, vitamin C breaks down quickly in sunlight after being added to the water, and the supplement can give the water a funny taste that discourages the guinea pig from drinking enough. Specially-made guinea pig vitamin C tablet supplements are a much better choice. I use Oxbow Daily C and my girl clearly views her morning vitamin as a treat. Guinea pigs have open rooted teeth, which means their teeth never stop growing. This means that your piggy needs to constantly chew to wear away her teeth so they don't grow dangerously long. 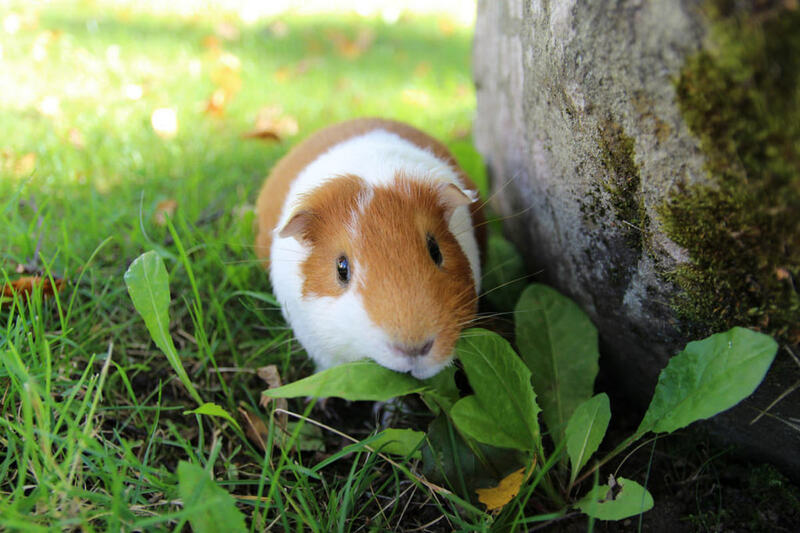 If your cavy's teeth aren't worn down naturally by chewing, you may end up having to get them trimmed down at the vet. That isn't fun for anyone! Guinea Lynx has great information on cavy teeth if you want to know more specifics. The best way to keep your pet away from the veterinary dentist chair is by providing plenty of tooth-dulling things to chew on. Hay does a good job of wearing down teeth, but providing wood chew toys is also important. Guinea pigs can be very playful, so wood toys that roll around or hang down provide a bit of extra fun and exercise! Guinea pigs are fun, playful, super cute, but they are also naturally shy, somewhat skittish, and definitely a bit higher maintenance than many other rodent pets. They tend to live several years and require gentle handling and greater care than your average hamster! I enjoy the extra attention I give my guinea pig - it makes her feel more like a pet than some rodent stuck in a cage. But beware - if you adopt a guinea pig you may find yourself trapped by her cuteness, eager to please her with special snacks and comfy hideies, and maybe even falling prey to the guinea pig costume trend. This website is so helpful for me and my cavy! How big of a cage do I need for two guinea pigs? I'm getting 2 male baby guinea pigs soon, and this was soooo helpful! I just got new guinea pigs! Thanks for the tips! Thank you so much I am getting a new pig and I am knowing what to get for a gunnie pig thank you so much. This info will really come in handy! Thanks! 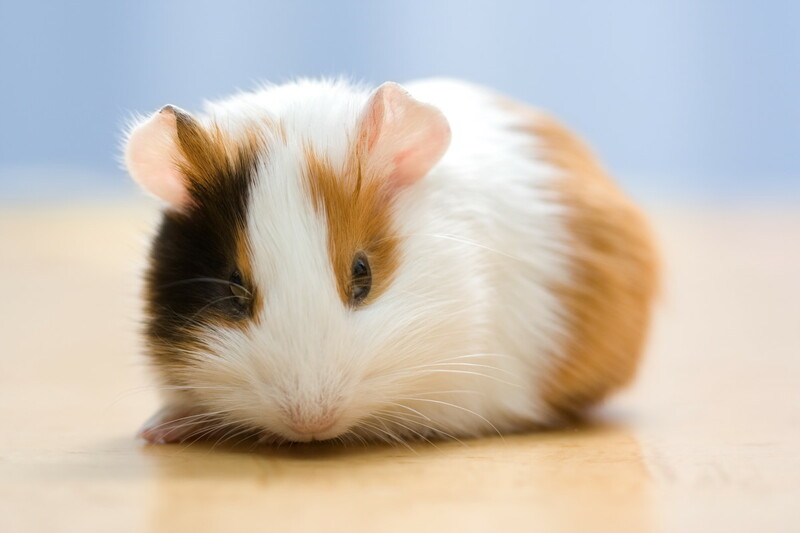 I am getting two guinea pigs soon.So exited! Thank for all this info! It'll really be useful! This is a great read overall with lots of useful information. Very good and informative but you left one important thing out. 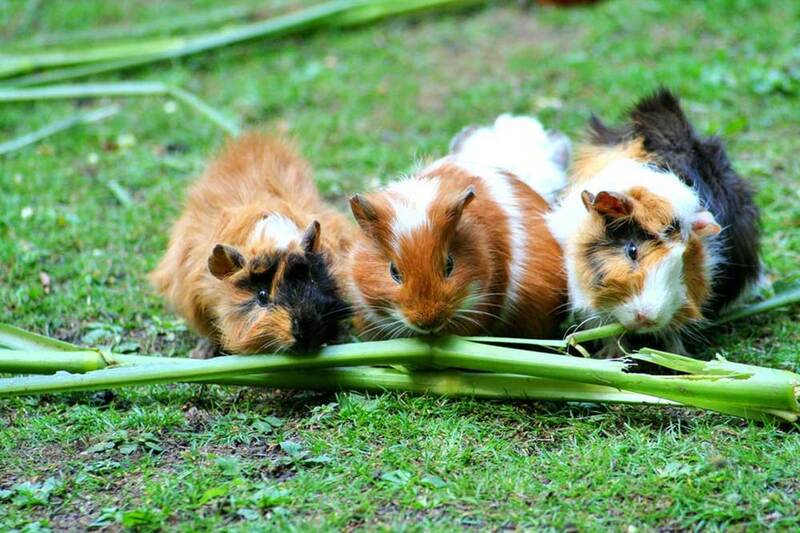 Guinea pigs are very social animals and should always be kept in a minimum of pairs. If you must keep only one, you have to spend an extra amount of time with it so it doesn't get lonely. Just thought that should be added in! I know this is an older post, but I'm taking a chance and thanking you anyway. I recently piggie-sat for a friend to see if I could handle the level of maintenance required, and I totally fell in love and want to get my own (or a pair). Now I want to be doubly sure that I could give one of these sweeties the care and attention they deserve, despite being gone from 8am-7pm during the workweek. I'm not 100% yet, by your instructions and attitude were both super helpful. This article was very, very helpful. I thank the person who wrote this. I loved having guinea pigs years ago and if I ever do again, I definitely want to have a nicer home for them than the little box with pine shavings I used to use. These are such great tips. What do you use on bottom of cage? It looks like regular fabric. ! Do you have 2 so u can switch and wash one at a time . Is it beer to use the fabric instead of the bedding chips from petsmart? You're so right, mdscoggins. All pets take special preparation and care! Thanks for stopping in. Thanks so much! I'm pretty fond of her. She's out eating right now - I love watching her eat! It's just too cute. Aquarium is better than a wire-bottom cage, at least. And I think that's the way of life - we look back and wonder how on Earth we did the things that were totally normal at the time. I hope this helps her see how much work a guinea pig really is! My family seems to think she's pretty spoiled! Thank you. Thank you! On both accounts. I had a guinea pig when I was growing up. She was a sweetie. I think we did everything that your hub says not to do... for example, she lived in an aquarium because that was normal back then. I would say your Guinea Pig gets the best care possible. This has been educational and interesting to read. Congrats on HOTD. Congratulations on HotD. Posting to my pet animal board. This sweetie is sooooo cute and precious. LOVED this hub, VOTED IT UP. Congratulations for being selected HOTD. Congratulations on the Hub of the Day award. 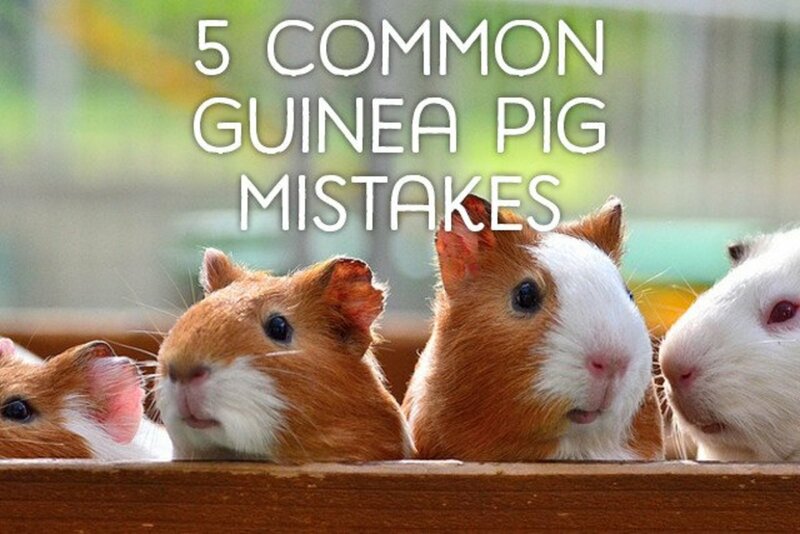 These are great tips for Guinea pig lovers. A very deserving hub of the day. Hi Natasha great tips. Getting any pet takes preparation and responsibility. You lay it out very simply. Birds seem to enjoy mirrors. My husband wanted a lop-eared rabbit, but I convinced him a guinea pig was a bit more apartment-friendly! Soooo cute. I had a miniature lop rabbit for 6 years. It was special. Now I have a cat. My sister had a cockatiel bird who used to hide for hours inside a small rectangular box with a mirror at the end. Socializing with his own image? bloggingvijay - Thank you! You're right, every pet has its own special needs. DzyMsLizzy - That's something a lot of people don't realize - they can't walk on wire grids like a lot of other rodents! The play block maze sounds amazing! I bet Tiki would enjoy something like that - especially if there were bits of bell pepper and carrot involved! mySuccess8 - Thanks! She's pretty spoiled. PinkstonePictures - Yep, she's a super cutie! Thanks. ArtDiva - Hamsters are definitely escape artists, but my mice were the worst! Bunnies and guinea pigs actually have a lot in common. Total respect for your knowledge of guineas and your fluid writing style. I am new to this type work, and I must acknowledge how impressed I am with what I read here. Excellent article!. Always wanted one of these cuties. Didn't realize they needed so much space. But then, so did my little rabbit, and the hamster...forever escaping. 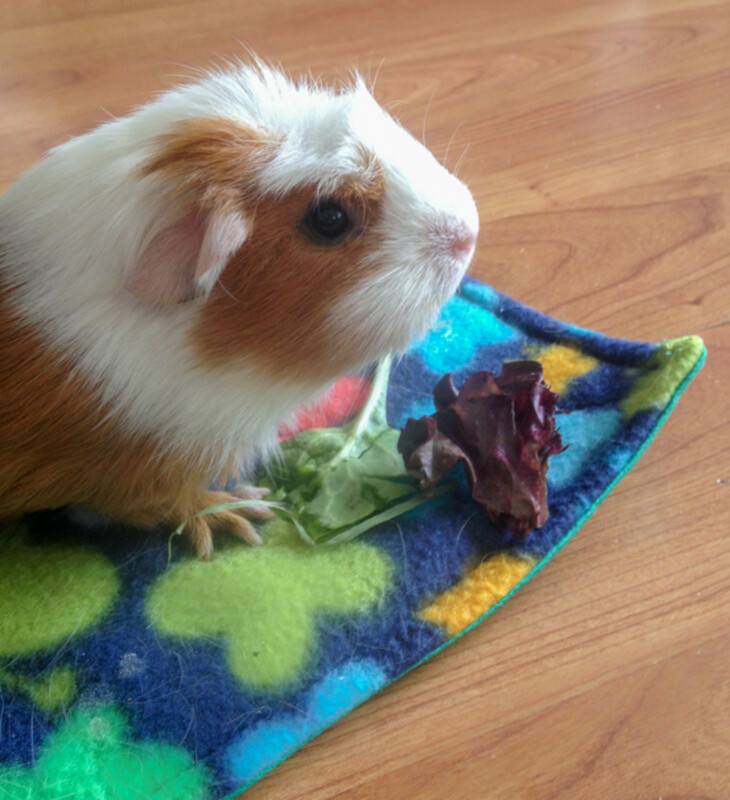 I am really pleased to read how well you are taking care of your guinea pig by giving the pet a good home with proper attention and living space. We can learn a lot from this Hub which explained very clearly, with nice photographs, the basic requirements for adopting one. Congrats on Hub of the Day! First, BIG congrats on Hub of the Day! Well deserved and the photos are just awesome! So glad that you've emphasized that these are not "beginner" pets. I'm on the Board for a pet shelter foundation and these little ones definitely deserve all the humane care as any other pet. A must read for the new Guinea Pig owner! Congratulations! Congrats on HOTD!! Most interesting! When my elder daughter was just out of high school, she wanted a pet, but my then-husband said 'no' to cats or dogs, so he compromised at Guinea Pig. She eventually had two of them, each with their own cage. We got them really large wire cages that were about 3 feet long, 18" wide, and about the same height as width. We had galvanized trays made to fit under them, to catch spillage and contain any urine leaking through. At that time, we had to improvise with pet store advice and our own research, and concluded that putting newspaper down over the wire mesh and under the pine bedding/litter would protect their little feet. And yes, cleaning the cage often. For playtime, we bought a set of kindergarten wooden blocks, (unfinished), and would set them up in 'mazes' on an old section of carpet, blocking off escape routes to under the bed with various items. We'd sit in this enclosure with them, and watch as they ran around the maze, chewed the blocks, or ran figure-8's around our feet and behind where we were sitting. From their upstairs quarters, they could hear lettuce being gotten out of the refrigerator downstairs, and would call out loudly to let us know not to forget their share. They were so cute, and each lived about 6 years. Good hub and congrats for hub of the day and nicely explained about guinea pig in the article. Yes for every pet we need to prepare some things for the pet before adopting. What a great hub Natasha. I've never owned a Guinea pig but I'm prepared to now. Great tips for anyone considering bringing home one of,these cute, furry little creatures. I've never actually had a gerbil, but I've had at least two of all the other usual rodent pets! Guinea pigs sure do pack a lot of personality into a tiny little body. Thanks for stopping by and taking the time to comment! This is an excellent hub, Natasha. It contains a lot of great advice for guinea pig owners. I've looked after my school's guinea pigs during holidays and think they're lovely animals. I've also had a hamster and gerbils as pets and agree that guinea pigs are quite different! Awww, so cute! They are really precious. What a cutie! I've never had one but have known people who did. I always thought they were so cute. This is a great hub and very well written! I would think anyone interested in owning one of these little critters would do well to read this. That is too funny! Yeah, they're amusing little critters. We don't have cable or anything, so we joke our favorite channel is "Tiki TV" because watching her run around is better than watching a TV show, anyway. How weird that you posted this. We just got two of them. They live with our quail in an aviary...a big aviary...and they are quite at home there with the birds. Fun animals to have for sure.